The quality of the air impacts human health, agriculture, and visibility, and is also an important consideration for transportation planning. 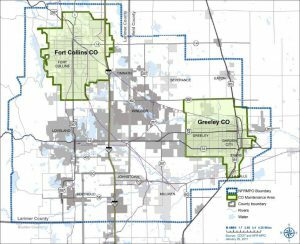 The NFRMPO is the designated lead planning agency for Carbon Monoxide (CO) and works with the Regional Air Quality Council (RAQC), which is the designated lead planning agency for ozone. 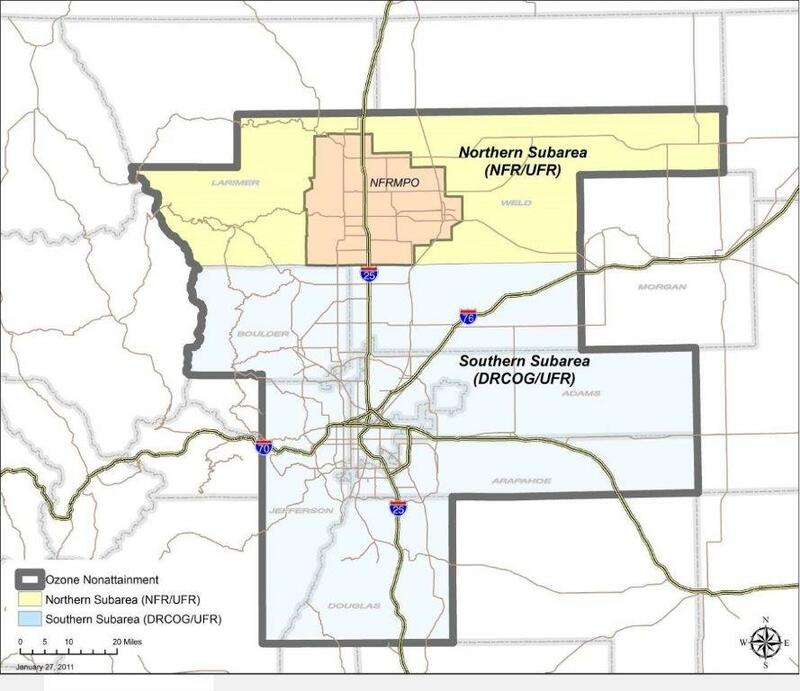 In addition, the NFRMPO works with the Air Pollution Control Division (APCD), part of the Colorado Department of Public Health and Environment, and the Environmental Protection Agency (EPA) to develop plans to address air quality issues and ensure the NFRMPO’s regional Transportation Plans meet or exceed air emission requirements. While levels of carbon monoxide in the region have been reduced below the national standard, ozone in the region is still exceeding the national standard. To learn about how ozone is formed and its health impacts, visit the What is Ozone? page. 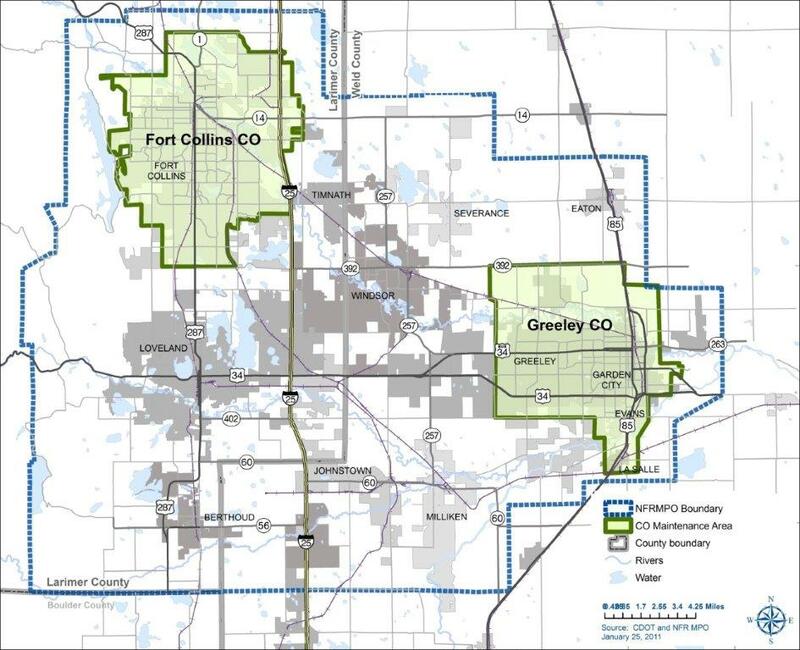 Fort Collins and Greeley are both Carbon Monoxide Maintenance Areas, meaning the cities have reached their air quality targets and must maintain the standards for ten years. Fort Collins is in its second 10-year maintenance plan, lasting from 2013 through 2023. Greeley is in its second 10-year maintenance plan, lasting from 2009 through 2019. The NFRMPO region is within the Northern Subarea of the Ozone Non-Attainment area. In 2016, the area was bumped up from a Marginal Non-Attainment to a Moderate Non-Attainment area by the EPA for not reaching required ozone reductions. Planning Council member Gerry Horak, Fort Collins Mayor Pro Tem, also serves as a Board Member of the Regional Air Quality Commission (RAQC). 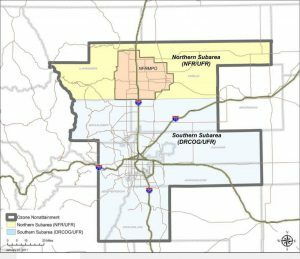 The Denver-North Front Range (Northern Subarea’s) 8-hour ozone nonattainment area consists of Larimer and Weld counties. Ozone serves as a protective layer in the stratosphere, but is unhealthy at ground level. When emissions from local industry, gasoline-powered vehicles, and paints are heated up by the sunlight, ozone forms and can act as a harmful air pollutant. Because ozone reacts with the addition of heat from sunlight, it is worst in the summer months when it is the hottest with the lightest winds. At ground level, ozone is a health hazard for all of us, especially the young and elderly. Those who are active and exercising outdoors may experience breathing difficulties and eye irritation. Prolonged exposure may result in reduced resistance to lung infections and colds. Ozone can also trigger attacks and symptoms in individuals with pre-existing conditions, like asthma or other respiratory infections like chronic bronchitis and COPD (Chronic Obstructive Pulmonary Disease). When ozone is particularly bad, the RAQC and the Colorado Department of Public Health and Environment (CDPHE) issue Ozone Alerts. These reports are automatically updated on the NFRMPO website and are tweeted on the NFRMPO’s Twitter account (@NFRMPO). The NFRMPO must prove it can meet air quality conformity to continue to receive federal funding. The NFRMPO’s TIP and projects must be in line with air quality goals. Each update to the TIP and the Regional Transportation Plan must obtain approval from CDPHE, AQCC, FHWA, and FTA to ensure the projects meet these goals. Conformity for the Amended 2040 RTP was determined in March 2017, and conformity for the FY2019-2022 TIP was determined in June 2017. In addition to new TIPs and amendments to the RTP, conformity can be required when a local jurisdiction receives funding to complete a regionally significant project. In June 2014, the NFRMPO’s Planning Council defined seven types of projects as regionally significant. For example, a regional transit project between jurisdictions and adding a travel lane at least one centerline mile in length are both considered regionally significant. The definition is provided in the document below.